As you may have read in my previous posts this year, I stepped away from many years as a kindergarten teacher and walked into the third grade. It has been an awesome change for me but has posed some challenges too. At the beginning of the year, we changed our scope and sequence to support some new units that had been revised, meaning I would be starting an information unit on personal expertise in late November. I was feeling pretty confident about moving from narrative to information and thought it would be a good shift, knowing that the students and I both had some experience with this genre. At the last minute, the decision was made to go back to the old scope and sequence, meaning my next unit would be personal essay. Unfortunately this change happened quickly, right before the holiday. I was still in the process of fighting off a sinus infection when this all happened and ended up in bed most of the break, leaving little time for me to travel to school and prepare for the new unit. Needless to say, I was nervous. I had never taught an essay unit and this was going to the be the first time my students had ever experienced an opinion piece with this structure. I started off the unit relying heavily on the curriculum I was given by my district, which as I looked it over decided was not going to work. What was I going to do? Lucky for me I had a friend coming to visit mid-week, just in time to take a u-turn and start over. Annemarie Johnson, a reading and writing consultant, offered to spend a day with me this week to see what was going on in my classroom. When we planned this a few weeks ago I had no idea what to expect other than some great conversation and learning from one another. What I got was so much more. Annemarie listened to my concerns and helped guide me through how to make the shift in my unit and start over. We co-taught a lesson together, teaching the students the boxes and bullets method from the Unit of Study and she shared some charting ideas with me. Together we got the class going in the right direction and I feel so much more confident. 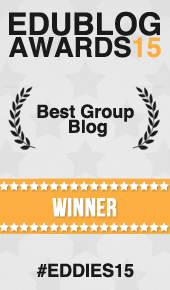 My first mistake had been using text examples that had big ideas and opinion statements with heavy meaning. The students were having to do a lot of work not only understanding the big idea but then generating evidence from their life that matched. 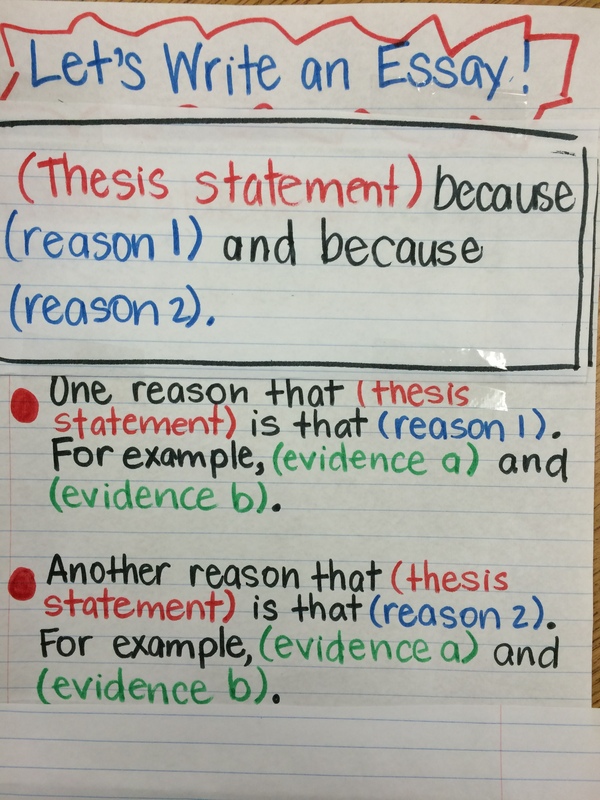 I needed to simplify my model and guide students through a topic that was already written in their head. 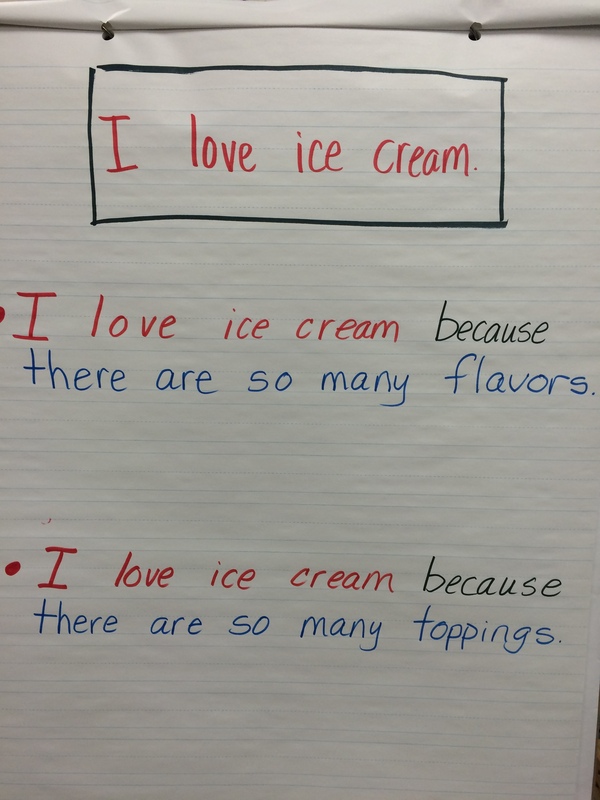 We chose the thesis statement, “I love ice cream.” Simple, clear and very relatable. From there, we had the students generate two reasons and then showed them a chart that would show them a “fill in the blank” structure using our boxes and bullets plan. We verbally wrote the story and I cold called on students to fill in the evidence with lists or personal stories. After a few run-throughs, the class got the hang of it and could hear the essay writing itself. As we move through the unit I will share the progress. I’m really excited to see what happens as we move toward deeper topics, meatier opinion statements, and more sophisticated evidence. The class is in the beginning stages but catching on quick. I think as long as I move through this process adding layer upon layer the quality of their work will really shine through. I loved reading this! This is a great illustration of the power of collaboration. I learn so much from working with my colleagues. I think it is so important for students to see teachers learning with each other…… and it is sooooo much fun! Betsy I get to work with Annemarie a lot, and I’m extremely grateful! First, I LOVE your openness to learning right alongside your kiddos! Sometimes this is the BEST! The method you have demonstrated here makes the writing assemble, making the genre attainable for all writers, so refreshing! Betsy, it was SO fun spending the day with you and your students. What a bonus to get to co-teach with you–we made a great team, I think! Looking forward to hearing how this unit turns out. Your students are in such capable hands. I love how reflective you are (even when you’re sick!). Hoping we get to do this once or twice more this year! I’ve been collecting funny, interesting, and beautiful mentor texts, as well as inspiration for topics. Great! Thanks for sharing, Beth. This is really helpful to me Betsy! I have to teach literary essay to my third graders. I think starting with something concrete and understandable to get the idea of what an essay is, is a really great idea. The color coordinating lines are awesome! BTW: I loved teaching personal essay. I have a bunch of resources on my home computer. LMK if you need anything. Happy to help! @ Stacey–thanks! Feelings are mutual!